but is it worth the price? Updated with the MX-800. Naturally, the notion of a “luxury product” means that the price/performance ratio is a little bit skewed. If your major concern is getting the most remote for the buck, then you’ll likely want to jump on over to our review of the Home Theater Master MX-500 which, at a mere $189 USD MSRP, is a definite “big bang” that offers many of the MX-700’s major benefits at a fraction of the cost. However, if your curiosity is piqued by the idea of a computer connection, quicker setup, twice as many devices, more commands, infinitely more macros and the ability to share configurations on the Internet, then keep on reading! So just what sort of price range are we looking at? To paraphrase an old saying, “if you have to ask...”! Throw your MX-500-based conceptualizations out the window and take a seat... because the MX-700 rings in at a cool $499 USD MSRP. 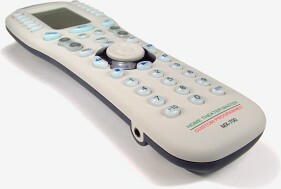 Of course, you actually get two remotes for your money: the MX-700 is bundled with a little partner in control, the MX-200 SideKick, which features all of the MX-700’s power with just one-quarter the buttons. (Note: the MX-700 is currently available for $349 without the MX-200 SideKick, which can be added back for $79.) It’s obvious that Universal Remote Control is aiming the MX-700 at a new class of “home theater masters”: those who demand the best. In fact, the MX-700 isn’t actually supposed to be available at the retail level. 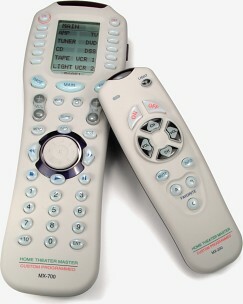 This remote is targeted to a specialized section of the consumer electronics industry: custom installers. Those are the people that design and install complete home theater and/or whole home systems costing anywhere up to hundreds of thousands of dollars. Universal Remote Control, already a known brand in the industry thanks to their SL-9000, inquired as to what custom installers in particular really wanted in a remote, and voila! came up with the enhanced MX-700. Usually, a custom installer’s client won’t go and specify the exact components in the system – never mind the remote – instead relying on the installer’s experience to pick out the best product. The installer then programs the remote and hands it over, ready to go. Thus, the MX-700 will likely not be appearing on the shelf at a store near you. Yet the MX-700 can still be found online if you look hard enough (like at the advertisers on the top of this page). And, since you’re still reading, the price hasn’t fazed you. That means you can be privy to one additional bit of advanced information: the MX-700 is a solid remote that absolutely won’t disappoint in even the most complex of home theaters. So, let’s find out just how well it works!